The quality of Grosh backdrops goes Digital! You are now able to project hundreds of backdrops either as the still images of beautiful backdrops that you’ve come to know Grosh for, or our new Animated images for projection. Our team of artists have worked diligently to create full 3D designs from showing snow fall in a night forest landscape to fireplace roaring in a Tavern interior to a Pirate Ship Deck swaying on the ocean. Begin browsing for your scenes on the Grosh Digital website where you can use keywords to search for popular shows, themes or even complete show packages. The show packages include at least 6 backdrops for the most well known Broadway productions including Wizard of Oz, Lion King, Beauty and the Beast, Aladdin and more. 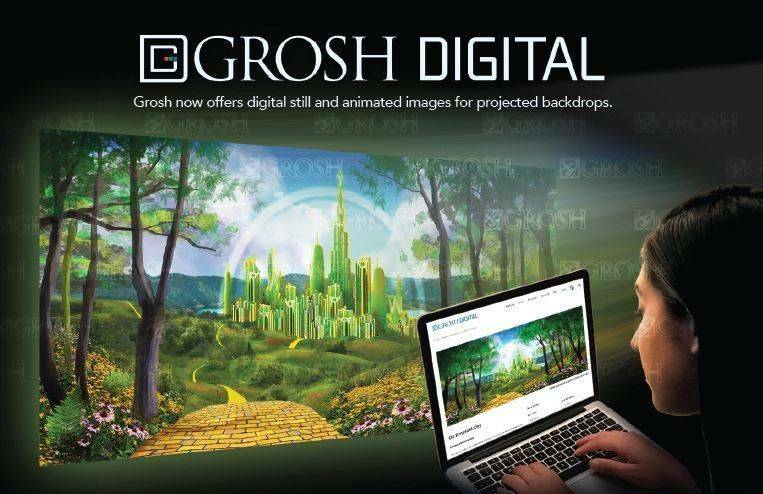 Once you have placed your order online you simply download the Grosh Digital Desktop application and login with the same email and password as you used when creating your account. After you have logged into your account, you will see the New Order you placed or a Demo order if no order was created on the Grosh Digital website. View the order by clicking on it and continue to EDIT to change the order sequence of your backdrop images, copy images, insert blank slides or change the transition of the slide. Preview the order and connect this directly to your desktop computer that is outputting to your projector. Once you are ready to begin your show, ACTIVATE your order which will start the rental duration time that the order was rented for. Upon activation, the watermarks on all images will be removed and you can begin your show!